Make this simple recipe. You can have this dinner on the table in no time. Heat oil in skillet over medium heat. Saute smoked sausage, onion, green bell pepper, mushrooms, salt, pepper and garlic, until veggies are tender. Stir in cooked rice. Garnish each plate with green onions. Note: Cook rice in beef broth instead of water. Oh, Christine, I love your suggestion to "beef up" the rice flavor with beef broth! 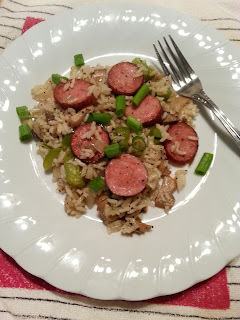 I'm not sure I can get pecan smoked garlic sausage here, so I'll probably throw some pecans (and garlic) into the mix with smoked sausage... whatever it takes to make this dish! Thank you. Hey, Kim, I don't know if you have a Kroger near you, but that is where I bought the pecan smoked garlic sausage is at Kroger. Thank you, Kim! This does sound so good. Did you find it at the met counter or was it packaged? I love sausage! Nothing better than onions, bell peppers and sausage! And, over rice! Wow a wonderful meal! !